Agile Prepcast Review for PMI ACP Exam Prep: The Agile Prepcast is a podcast-based audio-video program for PMI-Agile Certified Practitioner (PMI-ACP) Certification exam preparation. PMI-ACP certification is gaining popularity as more and more organizations across the world continue to adopt agile principles, practices, tools and techniques. Project management education providers are also stepping up and developing training programs to cater to the demand. One such self-paced online training program is The Agile Prepcast. I used this program for my own PMI-ACP preparation and passed the exam in the first attempt. This post is a review of the Agile Prepcast and aims to help PMI-ACP aspirants make an informed decision about purchasing this product. 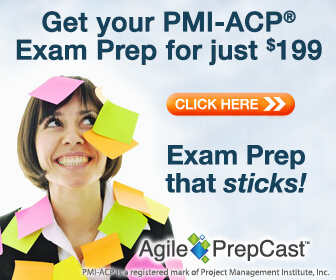 The Agile Prepcast is a podcast-based audio-video program for PMI-ACP exam preparation. It has over 90 lessons with a total duration of over 40 hours. The video material is in the form of Powerpoint-style presentations (you see the slides, not the presenter). You can use it on your computer, smartphone, tablet or any modern multimedia player. Total file size of all episodes is about 5.5 GB. The material gets downloaded to your computer automatically, by simply pointing your iTunes (or other similar player) to a web URL. Using this workshop, you can earn 37 Contact Hours, 21 of which are a pre-requisite for the PMI-ACP Exam, at your own pace and anywhere. You need to pass a 25 question final exam to receive your 37 Contact Hours Certificate. You must answer 17 out of 25 questions correctly in order to pass the exam. You can take the exam anytime and as many times as you want, after 2 weeks of purchasing the program. It is accompanied by a 100+ page student workbook, which includes a 50-question sample exam. It is based on 12 PMI-ACP books recommended by PMI. The material is very comprehensive and provides complete coverage of all the domains listed in the PMI-ACP Exam Content Outline including all the major agile methodologies and frameworks such as Scrum, XP, DSDM, Lean, Kanban, FDD, Crystal, and ASD. It includes several interviews with Agile Experts on applied concepts such as Agile and Project Portfolio Management, Scaling Agile to the Enterprise, and more. It also includes three interviews with successful PMI-ACP exam candidates. All the interviews are generous in length. The candidates talk about their reasons to go for certification, test preparation approach, study material used, lessons learned and best practices from their experience on the PMI-ACP exam. The accompanying student workbook (PDF) is an extremely useful resource. It provides a 50-question sample exam, an outline of all the lessons, exercises, tips, mnemonics, a topic index, links to tons of videos and external resources, and much more. The quality of questions on the exam is quite good and answers are clear and crisp. You also get access to an online forum where Cornelius personally answers your questions. This can come extremely handy in clarifying doubts. I have written at length about Cornelius' presentation style in my review of the PM Prepcast. So, I'm not going to repeat that here. He's a great speaker and presenter, and I really enjoy listening to his podcasts. Having said that, I have a few suggestions for improvement in the next section. The content is too long and broad-focused. PMI-ACP exam requires 21 contact hours of training whereas this program provides 37 contact hours (with over 40 hours of content). I prefer to have a more focused program with no more than 21 hours of content that helps me learn Agile concepts and pass the exam. I know that there's no body of knowledge (similar to PMBOK) for Agile, but my complaint is about the lack of focus on important topics. It's common knowledge that the PMI-ACP exam focuses very heavily on Scrum and XP, and to some extent on Lean and Kanban. However, the Agile Prepcast does not distinguish the important topics from the not-so-important ones. For example, it has 12 lessons totaling over 8 hours on DSDM, Crystal, and ASD - the topics which found no mention on my exam. As a student of the Agile Prepcast, I wanted to focus on the important topics. During the exam, I felt under-prepared on important topics and over-prepared in less important ones. The Agile Prepcast mostly tells you 'what' and not 'how' of Agile. It helped me pass the exam, but did not really help me learn a whole lot about applying Agile in the real world. I liked the 3 episodes on Kanban with Josh Nankivel (actually those were the best lessons among all the content). A few more similar lessons could have made the program more interesting and bring in different perspectives. There could have been more real life stories and examples instead of just going over the slides. Having different presenters could have added variety. This is not to say that Cornelius is not good presenter. In fact he's a great presenter, but listening to the same voice for over 40 hours can become monotonous. There were too many stock images that could have been replaced with images relevant to the topic. After a while, I got bored with the stock images, and found them to be distracting. I remember that in my CSM class they showed so many real images of Kanban boards, Agile artifacts and what not. The content organization could be improved. There's lot of repetition of the same concepts across various lessons and that increases study time. The Powerpoint SmartArt looked fine in 2009 when PM Prepcast was launched. But it looks a bit dated now in 2013-14. Different slide design could have helped. It's just a personal preference though because I see Powerpoints every day at work. At the end of each lesson, a couple of practice questions could have been added to reinforce the concepts. Despite the shortcomings, the Agile Prepcast is an extremely polished, professional and top quality program. It’s extremely affordable compared to classroom-based programs, which can cost several thousand dollars. Overall, it’s still one of the best self-paced online programs for PMI-ACP exam preparation. Complement this program with Mike Griffith’s PMI-ACP Exam Prep guide and a few good quality PMI-ACP sample questions, and you should have a good chance of passing the PMI-ACP exam. I hope you found this review useful. Thanks for reading. Your comments and feedback are welcome. When I recommend a product, I’m putting the credibility of this site at stake. Therefore, I recommend only those products that I genuinely believe will help people in achieving their goals. If you purchase this program through this page, you’ll be contributing toward the maintenance of this site and enabling me to bring more quality content your way. Thanks for sharing. I also used this prepcast to prepare for the exam. I find this material too long for my taste. What I did is i convert it in mp3 formats and listen from my mp3 during my long runs (I'm preparing for a marathon). But over-all, I buy it because it's cheap. Since I'm not a P.R. here in Singapore, paying $3,000++ to attend a CSM training seems so heavy on my budget, so this could do the trick atleast for now. I also used Mike Griffiths Book and probably subscribe to some online practice exams services. We discussed this before in another thread. I would not spend $$$$ on those expensive training programs either unless I get sponsored by my company or at least get a good subsidy from the government. You have the best study guide. Focus more on Scrum, XP and to lesser extent on Lean and Kanban. You highlighted a good tip that I missed in the review. I used to exercise while listening to the Agile Prepcasts lessons. It helped increase my concentration during the lessons. Good luck for your exam, and do come back to share your lessons learned. Bullseye!! I had used prepcast of PMP and i thoroughly liked it. It really helped me to progress and also helped me to create an interest to kick start with the preparation. For the same reason i decided to go with prepcast for ACP as well. Your review on ACP is so true. Its way to dry and long. Its just not getting over, and i'm losing focus now. :) The next very important point, you mentioned brilliantly, is it lack the topic of importance with exam in focus would have been really helpful. However still i feel prepcast is one of the good reliable cost effective material available online. I seriously feel Cornelius should consider editing alteast the repetitiveness on the prepcast and make the prepcast focus more from an exam point of view. Also got to say this, as i'm leaving a comment for the first time, you are doing a fine job. I have been frequently browsing deepfriedbrain from my pmp days. It's interesting to see that my views are resonating well with the other users of the Agile Prepcast. I had shared the same comments with Cornelius much before posting them on this blog. I hope that he will also take notice of the other comments here. The PM Prepcast is a blockbuster, but I can't say the same about the Agile Prepcast :) I got a feeling that they tried to make it as a good resource for learning Agile that can be useful beyond the exam. But it ended up somewhere in the middle. On one hand, it's too long and broad-focused for PMI-ACP exam, and on the other hand, it's not an ideal tool to learn Agile methodologies like Scrum and XP. Overall, it's still one of the best tools in the market for PMI-ACP at the moment. Thanks again for your comments. Hope you will come back and share your success story soon. I am planning to start my preparation for the PMI-ACP exam. Is Agile Prepcast still a good resource to start with or do you know of any other alternative? I am a bit low on my budget and would like to limit on my material purchases.